HeatedXchange performs as either an acoustic duo (playing stripped-down versions) or a full electric band. We play all genres including top 40, classic rock, 80's, 90's, country, Motown, pop, dance and anything else you can imagine. With heatedXchange duo, we take our years of experience in high-end entertaining and transfer it into a nice, small intimate package for the duo and with the full band we kick it up into a full on party. Each event is custom crafted to the clients' specific needs and all music is performed live on the spot with no backing tracks. Real musicians playing real music. Available for Happy Hours, Cocktail Hours, Weddings, Bars, Lounges, Private & Corporate Events. We had the pleasure of booking HeatedXchange for a car launch at one of our dealerships recently and they were amazing! Played the perfect music for our event theme. We would definitely hire them again. My wife and I booked Heatedxchange for a private party and we were extremely pleased that we did. Sam and Rob are not only musical geniuses, they one of the most professional individuals. They understood our audience and the genre of music we all love to hear. I would certainly recommend Heatedxchange for any future party. Book them now before it is too late! A friend of mine put me onto 'heatedXchange' awhile back when he suggested we see them while I was visiting NY. When time for my girlfriend's 30th Birthday blowout came along, I figured they'd be a perfect fit, assuming they were willing to make the trip to NC. The stars aligned and they made the trek, and absolutely rocked the house (well, backyard). Energetic, professional, and fun. There was a great mix of old/new music and genres. Would definitely recommend to others. Audience members/clients can expect a diverse evening of music ranging from classics and standards to top 40 current hits. We specialize in reading a crowd and adapting our set list on the fly to appropriately entertain all guests. Our mix of upbeat, down tempo and sing-a-longs will leave everyone with a night they will remember! Beyond our ever-growing set list, if given ample notice, we can personalize our performance by learning specific songs chosen by the client. 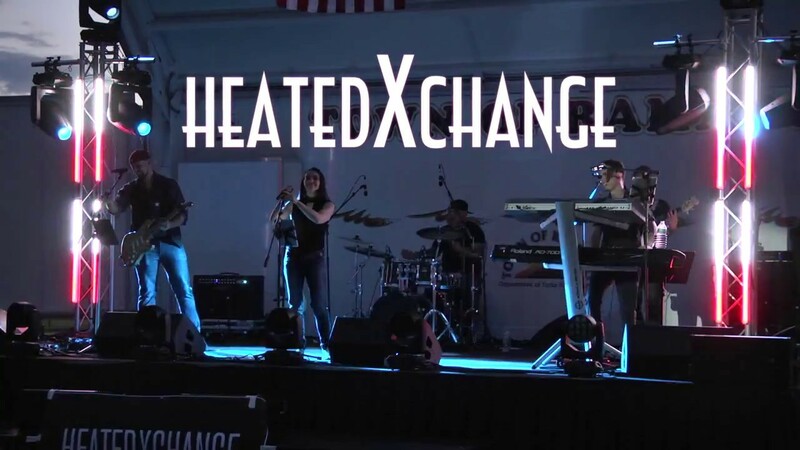 Just to give you a little history, heatedXchange performs as either an acoustic duo (playing stripped-down versions) or a full electric band. We play all genres including top 40, classic rock, 80's, 90's, country, Motown, pop, dance and anything else you can imagine. With heatedXchange duo, we take our years of experience in high-end entertaining and transfer it into a nice, small intimate package for the duo and with the full band we kick it up into a full on party. Samantha is a singer-songwriter who has been singing and performing professionally since the age of fourteen. Growing up, she performed in various original, cover, and wedding bands, exposing her to an assortment of musical styles early in her career. From showcasing for record labels at the age of sixteen to performing throughout New York City, high-end charity functions and worldwide music festivals, she has accomplished more than most musicians have twice her age. Now in her early twenties, Samantha is able to use those experiences and perform to any type of crowd. Samantha is currently writing and recording new songs to release on her upcoming EP. Samantha's music is rooted in pop/dance, but she draws influences from artists in all genres. One of the many benefits of hiring heatedXchange to perform your event is that we come fully equipped with top-of-the-line, professional equipment. When possible, we prefer to do a site tour of each event location to make sure we bring the proper sound and lighting equipment. Our set up time is extremely quick and we occupy a small footprint in the performance area, allowing more room for guests.